y weekends are normally pretty relaxed. I’ll catch up on my sleep, binge watch Netflix, and I’ll buy groceries. This past weekend, I woke up at noon and planned on sitting my bottom on the couch all day long only willing to move to refill my drink. I got a phone call from my friend asking if I wanted to go sailing with her and her dad, and I threw my swimsuit on faster than you read this sentence. Sailing never really struck me as exciting or adventurous. Well, I was sadly mistaken. I spent over eight straight hours on that sailboat, and it was hands down the most relaxing, exciting and peaceful thing I have ever done. I’m now obsessed with sailing and I want to share the excitement with you. There’s just something about it. You can’t go very fast, but you don’t really notice how slow you’re really going. In fact, I thought we were cruising on by before looking at the speedometer. My friend’s dad taught me how to sail, and that was amazing. It’s so simple yet delicate. The boat moves so slow that when you turn the wheel, you have to wait a few seconds before the boat actually begins to move in that direction. It was nothing like a car or a bike. There is also a long list of vocabulary words that go on with sailing. Everything has a funny name; there are even names for turning right or left. It’s all a very complex system with many hidden rules, but it’s a lot of fun to learn. I love water and I love being completely submerged in its presence. So to be sitting on top of the water, getting to see the waves and hear them go by was the most relaxing thing I had ever done. There were times where I would be sitting on the boat and two hours would have passed by without me taking my eyes off the water or moving a muscle. I swear, my bottom hurts from staying so still. It was so tranquil, peaceful and mesmerizing. I could’ve lived on that boat. I encourage you to take any chance you have to go sailing. I don’t think anyone can hate it or not appreciate the beauty of it. If you need to unwind and be calm, go sail. I know that’s a lot easier said than done, but just do your best. Here at Oklahoma State, we have a sailing club. This club will teach you all the things you want to know about sailing and you even get to race other school’s clubs. The man who taught me to sail was a member of the team when he went to school at OSU, and his son eventually became the club president. If you go to OSU and you want to sail, but you don’t have the luxury of owning a boat or you don’t know anyone with one, I encourage you to join the sailing club. I promise you will not regret it. Maybe it’s my inner pieces talking, but swimming is the greatest thing in the world. There is nothing I love more than being completely engulfed in water and the feeling of water gliding between my fingers. And I would wear chlorine as perfume. Okay, yeah maybe that last part isn’t so normal. Since it’s summer, I encourage you to get out there and go swimming at any opportunity you can get. Not only does it relieve stress, but it’s also proven to be one of the best weight-loss exercises you can do. Also, to all of my fellow asthmatics, it will do wonders for your asthma. Growing up, I could never participate in sports simply because my lungs wouldn’t allow it. Swimming was something I could turn to help build the strength of my lungs while being active. And the best part is you don’t sweat! And lucky for you, since you are a student at Oklahoma State University, you have total access to the Colvin Center, which is equipped with two pools. There is a large pool inside will multiple lanes to do lap as well as a deeper section for diving. There is also another pool outside that has a few lanes to do laps, a whirl pool and a shallow area for games such as water polo. And if you are interested, here are some fun and effective workouts you can try next time you take a dip in the pool! Ah, yes. A summer in Stillwater, Oklahoma. Here we have always had many classic ways to spend your summer days. You can lye down on a quilted blanket to count strands of grass. Or you can visit not one, but two of the local Wal-Marts. Or you could do something no other Stillwater summer civilian has done before... Kayak on Boomer Lake. Courtsey of White Rock Paddle Co., you can now experience a thrilling and adventurous summer all in the simple town of Stillwater, Oklahoma. They opened early spring and have been bringing smiles all across town. For the entire summer, you will find the little white trailer located on the southwest corner of Boomer Lake, patiently awaiting for you. Through Hell and high waters, the little white trailer will be there. Waiting. You can ride alone, with friends or family all around Boomer Lake until your arms fall off from such intense paddling. Anyone can enjoy this leisurely pastime at an affordable price! And if you download the Groupon app, you can even find discounts to save you money! You have a choice of paddle boating in a boat alone, with a partner, or you can stand and paddle alone. Going through adventures with someone, even if your strangers, helps for a bond. So I highly recommend taking your date for a paddle boat ride if you're wanting to make a lasting impression. It's also a great destressed. Imagine just sitting on a tiny boat, no one is bothering you. You can only hear the person your sharing a boat with talk. No responsibilities, no nagging, no nothing. Just you, the water and the sweat on your back. 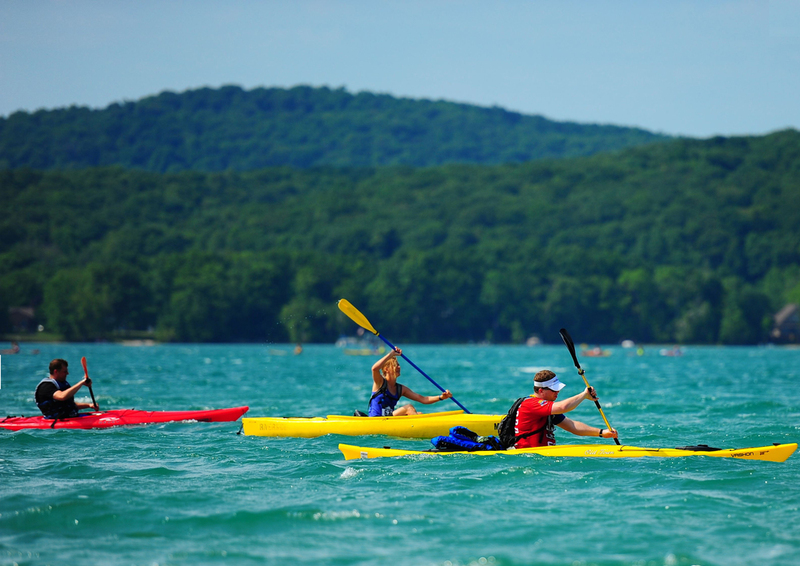 So come by this weekend and experience the White Rock Paddle Co.! Follow them on twitter at @paddle_stilly to find deals and events! We all know that the best part about going to a sports party isn’t the energy, the friendly competition or seeing your friends – it’s the free food. I know when I host a party, I always like to have clever snacks that fit the theme. So, I have made a list snacks that will be sure to impress your guests at your next sports party. Bake normal sugar cookies either store packaged or homemade. I’m cheap, so I prefer to buy the prepackaged kind. Bake your cookies, and as soon as you pull them out of the oven, you’ll need to poke of tiny hole through while the cookies are still hot. Next, take your cookies and and add green icing while it is still hot, that way it is smooth and even. Now allow everything to dry. Once it is dry, you can start adding details. You will want to add a gray line (the pole) with a red triangle at the top (the flag). Next, take black piping icing to add a swoosh, this will look like the path the golf ball took. This recepie is quick, clever and delicious. You’ll want to take an OREO (flavor and size is your own preference). Next you’ll want to take orange melting chocolate and place it in a pot on the burner. Take your “cake pop stick” and instert it into the cream of the OREO cookie. Carefully dip the cookie into the orange chocolate, and let the excess drip off the sides. Allow the icing to cool. Take black piping icing and add detail marks to create your own edible basketballs! Alright, this one is a little intense. Then, the night before you’ll have want to made a batch of Rice Krispy Treats. You can either use a thin and narrow pan, or use a large pan and simply cut the treats into strips. Surround the edge of the tray with your treats. Next, fill in your tray. Start in the middle with your thick guacamole. Then on one side, add queso while on on the other side adding salsa. Then, take a piping bag and add sour cream to make the yard markers. Along the outside of the stadium, add finger sandwiches using toothpicks. Fill the spaces in between the Rice Krispy Treats and the sandwiches with assorted chips. Here are more snacks to give you a little inspiration for creating your own snacks. They are all on our ResLife Pinterest page! I’m not a sports guru, but I just found out about the world-renowned FIFA controversy. I don’t know a lot about football but after reading a few articles about the topic, I can tell you a few overall issues at hand. Don’t worry, I’ll add links so you can find out more information. I was reading an article by CNN and I didn’t realize that soccer is the most popular sport in the world – over 240 million people regularly play the game. I also didn’t realize how important hosting the World Cup in your country was either. I was completely clueless on how to even host the World Cup in your country- you could’ve told me that they flipped a coin and I would’ve believed you. Hopefully you not just as clueless as I am. After doing a little reading, I found out that countries bid to have the World Cup hosted in their country and the highest bidder wins. Ta-Da! Why is hosting the World Cup in your country so important? Well, it stimulates the economy in that particular country. People from all over the world go to watch the World Cup and they spend money – Lots of money. It’s not cheap to bid, but the money that countries make off of hosting FIFA is definitely worth it in the long run. Just think about it, millions of people come to watch football, while they’re there they have to have somewhere to live and eat. If they like the area enough, they may come back to visit on a vacation with friends. Cha-ching. According to CNN, Americans associated with FIFA are allegedly accused of fraud, racketeering and money laundering for more than 20 years- I just want to know why it has taken so long for them to get caught. Now, that’s a question worth asking. Other countries that have allegedly done the same thing are Europe, South America, and the Caribbean. Election Day is around the corner, so some Europeans’ want the election postponed to ensure that the corruption doesn’t affect the election. Sepp Blatter has been the president for 17 years, and it’s predicted that he’ll win again, but the Europeans of the soccer governing body wants to make sure that no corruption is taking place, and if there is, they want to end it. Right now, he isn’t being charged or indicted with anything, but they just want to be careful. The scandal is making a few lucrative sponsors of FIFA worried about their reputation. Sponsors like Visa, Adidas, McDonalds, Coca-Cola and Budweiser are even thinking about reassessing their contract with FIFA. I wonder what’s going to happen to FIFA after this scandal boils over, will the Russia 2018 and Qatar 2022 World Cups be moved?